When a baseball player who seems to be nearing the end of his career is able to reinvent himself in someway and thereby maintain, or even improve, his performance, it is often referred to as a reincarnation. I am sure many Yankees fans are hoping Derek Jeter will be in line for one next season, especially considering the lengthy contract he is likely going to sign in the off season. However, after taking a look at Baseball-Reference.com’s snapshot of former Yankees outfielder Birdie Cree, one wonders if Jeter hasn’t already been reincarnated in pinstripes. 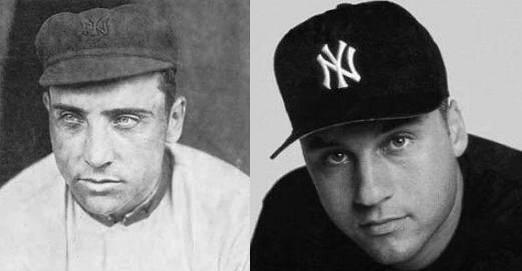 Birdie Cree (left) and Derek Jeter (right) share a striking resemblance that links over 100 years of team history. William Franklin “Birdie” Cree was a small town boy who alternated playing sports with teaching eighth grade before eventually getting a scholarship to play football at Penn State. An injury to his collarbone, however, put an end to his career on the gridiron, so Cree turned his attention to baseball. While attending Penn State, Cree not only played for the university, but also joined a series of semi-pro teams in an attempt to earn a little extra cash. Before long, he started drawing the attention of scouts, and in 1907 was signed by Connie Mack of the Philadelphia Athletics. Cree made his way to the Highlanders by way of the Detroit Tigers in what amounted to a three team deal that also included the Athletics. Although Cree made his major league debut at the end of the 1908 season, it wasn’t until 1909 that he began to fill more of a role with the floundering American League team in New York. Despite being a shortstop during his college and semi-pro days, Cree broke in with the Highlanders as an outfielder. After having a cup of coffee with the team at the end of the 1908 season, a campaign in which the team lost a record 103 games (a low water mark that still stands today), Cree established himself in the lineup the following year and became a key contributor to the Highlander’s momentary resurgence to the first division. After a solid 1909 campaign as a part-time player, Cree had a breakout season in 1910 that helped catapult the Highlanders to second place in the American League. During that season, Cree not only showed great skill, but also toughness. In a game against the Senators on April 22, Cree was beaned in the back of the head by a fastball from Walter Johnson, who wasn’t known as the Big Train because of his lack of velocity. According to published reports, it took Cree several weeks after the beaning to regain his batting form, and once he did, American League pitchers resumed throwing at him in attempt to scare him back into a slump. As the numbers attest, this strategy was unsuccessful. In 1911, Cree not only had the best season of his career, but also posted the best offensive numbers by any Yankees player to that point. Cree’s OPS+ of 152 as well as his batting average (.348), on base percentage (.415) and slugging percentage (.513) were all the highest totals by any Yankees’ player to date. In fact, until the arrival of Babe Ruth in 1920, it wasn’t a stretch to say that Cree was the best player the team had ever had. Cree’s success, as well as the team’s, was short lived. After a severe cold and a broken wrist conspired to put an end to what was shaping up as another outstanding season in 1912, the now 30-year old outfielder began to break down. Lingering effects from his broken wrist hampered him throughout the 1913 season, and then, after he reported to spring training in 1914 out of shape, the Yankees released his contract to Baltimore of the International League. While in Baltimore, Cree was able to revive his career playing for an Orioles team that dominated the International League, thanks in large part to Cree’s hitting prowess as well as the lights out pitching of a 19-year old lefty. By July, however, the Orioles encountered significant financial difficulties and were forced to sell off their players. The Yankees, as they were now known, were first in line to re-purchase the contract of Cree, but it was the Red Sox who got the best deal when two days later they purchased the young lefty, a man the world would soon come to know as Babe Ruth. Cree finished out 1914 in style, but the combination of further injuries and again being out of shape forced him into retirement after 1915. After his playing career, Cree returned to his native rural Pennsylvania and settled in the town of Sunbury, where he first started to make a name for himself in baseball. In addition to working various jobs at the First National Bank in Sunbury, Cree remained active in sports and became a decorated golfer and billiards player in local clubs. He died on November 8, 1942 at the age of 60. Besides their uncanny resemblance and status as lifelong Yankees, Jeter and Cree really do not have much in common. One was a self-made prospect, while the other was a high school phenom. One had a few flashes of brilliance, while the other is a sure-fire Hall of Famer. One went to work for a bank after his career, while the other is more likely to buy one when his playing days are over. Still, there is that one remarkable link that always seems to exist in baseball. Although Jeter will go down as an immortal icon in Yankees lore, while Cree has become more of a footnote, at least in terms of appearance, they are linked across a century of history by one distant gaze.